Most companies have teams in place: customer service, management, sales, etc. The challenge is that many team members have never been taught effective teamwork strategies. 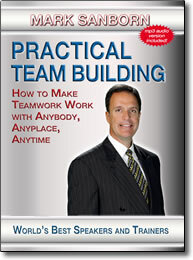 In this practical, easy to implement training session, award-winning speaker Mark Sanborn shares key ideas and techniques for building a more cohesive, productive team. You’ll learn the five characteristics of a unified team, six skills that all effective teams use, three reasons why teamwork doesn’t work, how to instill greater cooperation, and much more. These skills are applicable to anybody, in any industry, virtually anywhere in the world. Both team members and leaders will walk away from this seminar with an easy to use framework for developing a team where everyone wins. Former president of the National Speaker’s Association, Mark Sanborn is an international bestselling author and noted authority on team building, leadership and customerservice.